• Among the martial arts of Wudang, there are many odd and strange weapons, and horsetail whisk is one of them. 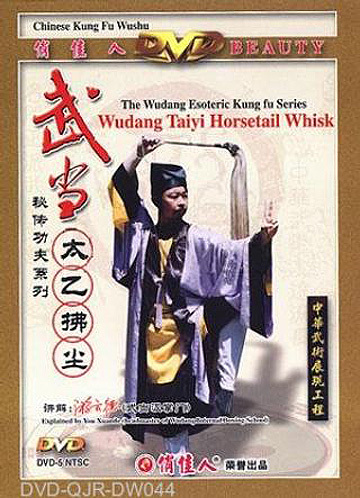 In the immortal Taoism system, horsetail whisk is a ceremonial implement. The great masters of the past generations were always carrying with horsetail whisks while touring around. For example, Taishanglaojun, Taiyizhenren, and Ludongbing were all famous for horsetail whisks. The unique style and characteristic come naturally. All of these had added boundless cultural charm to the Chinese history literature. The practicing style of the horsetail whisk was unique, with trenchancy skills, also with both hard and soft tactics, tight opening and close. Practice it as if a heavenly steed soaring across the skies, it would be with a powerful and unconstrained style, elegant behavior, and changing agility and leap. The most prominent ones were the fifth generation disciples of Wudang, Youxiaolong and Youzunlong. Horsetail whisk is dainty about felicity combination of body movements and whisk skills while in practicing. Furthermore, it has the good effect of keeping health, so it's popular with many people. This product was added to our catalog on Tuesday, November 20, 2012.